Another vector cut-out created in Flash. This is a Tadahiro Uesugi inspired girl that I created for my Manifestation music video. She has 11 separate girly bits so that she can be animated in a cut-out style. 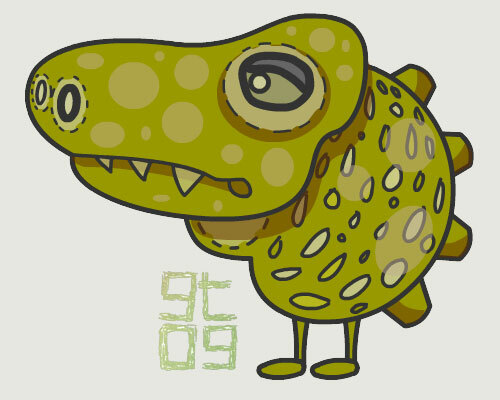 Croc character design. Vector graphic created in Flash. 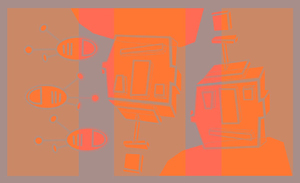 Some orange robots I made as an image for my website. Made with Illustrator. Here’s the opening adventure of Marmaduck. This is my first finished comic style illustration of a character from my sketchbook. I tried to keep things simple , hence no text bubbles and only four panels. I have always loved Double Fine’s comics (go to www.doublefine.com to view) and thought that their four strip panel sets were a good minimum number. Despite keeping things simple it was harder than I thought, but I really had fun creating the Marmuduck panels and it was an excellent new challenge for me. If anyone has any advice on how I can improve my comic skills for the next set, please let me know. I was also inspired by Pete Fowler’s great little comic strips from his ‘Ken’s Mysterious World’ series. I’ve included a scan below. I actually created this comic panel for my redesigned web site (which you can view at www.gilestimms.com, though it’s still being updated). 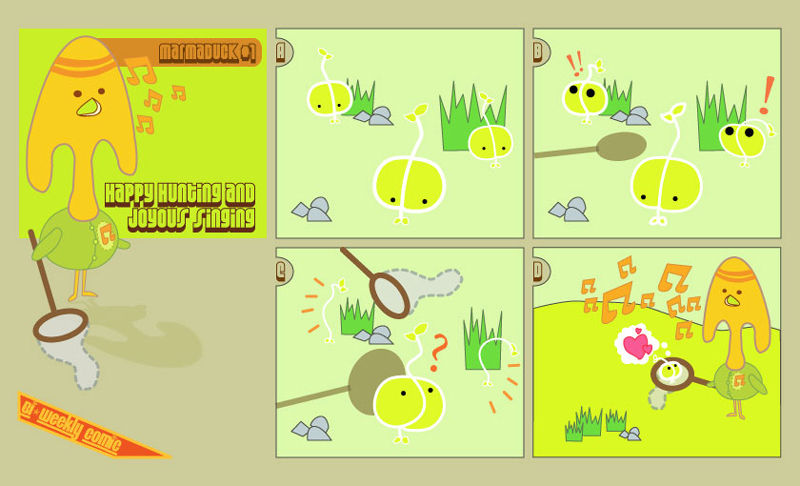 I thought that it might make the home page more interesting to have something different every so often, hence the comic. Hopefully I can create a new set every fortnight, especially if I keep things simple with the vector format. Anyway, this was entirely created in Illustrator.